Steve Cox, Vice President of Public Relations at Sodexo joined us recently for a stellar webinar on how to utilize earned media to enhance marketing and communications programs and drive organizational growth. For the questions we couldn’t get to during the live Q&A, Steve was kind of enough to answer them for attendees below! Read on to see how Sodexo drives PR growth with press releases, other important metrics and the future of earned media. Q: How are you distributing news releases and is your process a general blast of a focused approach? Steve: We use PR Newswire as our primary distribution vehicle – and given our strategy focused on broad distribution with the goal of aggregation and third-party pick-up to spur traffic into the Sodexo digital ecosystem, we generally employ a ‘blast’ technique (with some degree of focus and customization). Q: Do you still distribute press releases on the wire? Directly to press vs putting it on your website, social, etc? Steve: We use PR Newswire as our primary distribution vehicle, and leverage the US 1 Wire Service. That said, we do send directly to some targeted media members based on the topic/issue focus for the release. And we do post all releases into our newsroom on our SodexoInsights.com media publishing platform. Q: How do you measure “share of voice”? Steve: While we recognize there are a number of ways, with increasing levels of sophistication associated to measure share of voice, at Sodexo we use a very basic ‘brand mention’ method to establish our baseline. The brand mention count process is purely automated (for the baseline), although we do apply more sophisticated ‘human touch’ analysis methods to drill down into share of voice on certain issues, versus certain competitors, or in support of certain campaigns. Q: Is quantity of hits/views more important to either of you than quality of hits/views (full articles, interviews, etc.)? Steve: An interesting question, and while we’re certainly interested in quantity of hits/views for our content, we’re more interested in the actual quality of the content itself – believing that higher/rich quality content has a greater probability of generating useful hits/views (and appropriate engagement activities thereafter). Q: Sodexo shared slides that listed “media views” – how do you know those were the media, rather than just an average person or customer, etc? Steve: The concept of the media view is that based on our distribution – with direct distribution to media members/media organization-associated addresses – when a delivery to one of the ‘media-associated’ addresses is ‘viewed,’ that it counts as a ‘media view.’ This metric is certainly not scientific and does introduce a level of ambiguity, but if used as a directional metric vice a definitive metric it serves a useful, informative purpose. 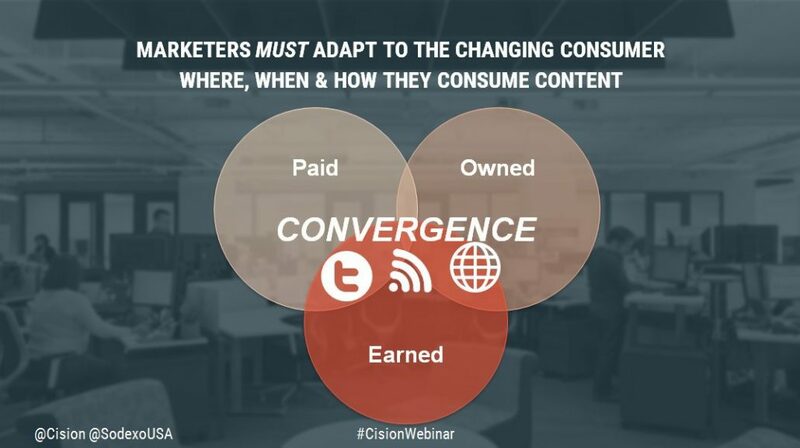 Q: How does pay-to-play come into play when it comes to the future of earned media? Steve: An interesting question, and while it may seem that paid promotion and earned media are mutually exclusive, they don’t have to be. Particularly in a media publishing construct, paid promotion supports earned media as a driver of traffic that ultimate supports engagement activities. This question really speaks to the idea of (perhaps imperative for) PR to credibly play across the full PESO spectrum (Paid, Earned, Shared, Owned media). Q: When pushing out content, how much emphasis do you put on the quality of content vs the importance of pushing out content daily even if the content is weaker? Steve: Volume for the sake of volume, regardless of quality would be a counterproductive pursuit – not recommended, and not the effort we’re pursuing at Sodexo. Quality of content is simply ‘table stakes’ – once established, volume/scale can be addressed. Ultimately the goal is ‘quality and quantity’ but quality simply has to be the first priority. Q: For those of us in one or two person PR departments, what do you feel are the most essential parts of the full strategy to implement first? Steve: This is both a good and difficult/situational question. For example, a B2C organization may decide that social media engagement is the place to start; an e-commerce-based organization needs a UX-focused web presence, and a B2B firm (like Sodexo) might see media publishing, and in particular media publishing on key business capabilities/offers or thought-leadership. As well, small PR teams really need to critically assess potential (i.e., the payoff for execution of any given tactic) vs. probability (the ability to execute, i.e., time, skills, dollars, etc.). 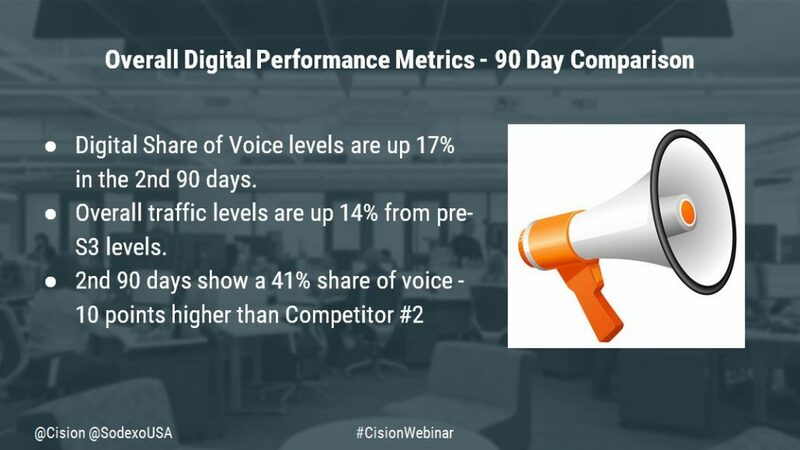 Q: Out of all your measurement stats, which ones seem to have the most impact with your C-suite executives and is SOV and traffic increasing the bottom line? Steve: Of the metrics we currently use at Sodexo, share of voice (SOV) and Brand Sentiment resonate with our C-Suite. However, given the maturity of our media publishing approach, it’s now time for a more mature measurement protocol that applies correlation of specific components, and ultimately terminates (i.e., can be traced into) demand generation, leads and/or some aspect of revenue generation. Want to view Steve’s full webinar? Catch the replay here!